All the people who supplied theories and hints are obviously much brighter than I am and I would very much like to meet every one of you! - A.C.G. I walked around believing that all grown-ups knew the secret of this book, though I never dared ask them how they did it, for I knew they would never reveal what I would have to discover for myself. (This, I knew, was how growing up worked.) - Reif Larsen from "The Crying of Room 45"
Welcome to the MAZE community where fans of Christopher Manson’s MAZE can come together to share ideas, hints, clues, tips, tricks, solutions, observations, etc. to the multitude of MAZE puzzles that have gone unsolved in the public sphere. Be part of the solution to MAZE. Does MAZE have anything to do with “Methods In Bioengineering / Alternative Technologies To Animal Testing”? And/or an adjacency matrix? Whew, you’re back! It was disconcerting to gaze into the Abyss and not have it gaze back. The reports of my abyss’s inability to gaze back are greatly exaggerated. Not sure if someone has already said as much somewhere on this site but, as a MAZE fan, I highly recommend you check out the production of “Sleep No More” currently playing in New York City. With 100+ Intricately designed rooms over four floors to explore, you will get lost in the mysteries that each contains. The audience is masked, and free to wander aimlessly or follow any of the characters that inhabit this breathtaking world. I have already attended this show 5 times, and am eager to return. 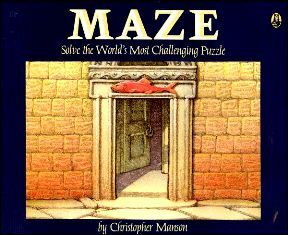 Now if we can just convince Punchdrunk (the theater company) to join up with Christopher Manson and create MAZE: the show. IIRC I was making a listed site about how to get from any room to room 45. I had abandoned that project earlier, but I will pick it up again now. New MazeCast! Everything you ever wanted to know about hats in the Maze. Check the MazeCast youtube channel. Would that be including Hatshepsut? Hey everybody, if you’re looking for something fun and mazey to do for the next three minutes, check out “Maybe It’s a Maze” — a MAZE parody song now up on MazeCast. Click on User Blogs > Aria’s Blog > Maybe It’s a Maze. Vocals by Hello Gregor, lyrics by Vewatkin. You’re welcome! I take my leave. I will check back every couple weeks, but, for the most part, my job here is done. On the site you will see a new tab called BEQUEST. It isn’t the sequel I was expecting, but what a sequel it will be! Meet me on the Guide page for the hints. Due to medical difficulties I will be posting the hints for the Riddle of the Guide all at once at 8 pm tonight, and sharing the solution tomorrow morning if no one gets it by then. I’ve emailed a few people about this who have shown a real interest in the identity of the guide either by posting and arguing about the topic on the site or by emailing me. I delayed launching the site two months just so that the date of launch would be Jan 13th 2013. Why? My idiotic love of symbolism. I’d missed 12-12-12 as a launch date so I figured if you rolled over the count of months to the next year January could be the 13th month…sort of. Making the launch date the impossible date of 13-13-13. Almost all the people posting on The Abyss have done so from the UK, US, and Canada. Less than 50% of people who post on the Abyss have been approved as members. Who are the other 50%? About 25% so are teenagers or younger (I figure) who believe they have it all figured out, and post insulting comments along with solutions which usually involve pop culture stuff that didn’t exist in 1985. About 20% are just straight up trolls. Usually pointing out how something they read reminded them of something crass. The last 5% make for interesting reading. These are people who think that MAZE holds the answer to life the universe and everything, or that MAZE is magical, or in one case, cursed. A few have between 50 and 100, the other 190 contributors have less than 20. The people who think MAZE is a magical book tend to complain in emails when I don’t post their comments. These emails range from light to threatening, but are often filled with explanations. > There is a room in MAZE (I forget which one) which when turned upside down becomes a gate to hell. > Manson is a mage from the house of something or other who has unprecedented access to Avalon, I think. > Aria, SP, spark of life, Vewatkin, Rebecca, myself, and others are all aspects of the celestial spheres playing out our predetermined roles. > The United Kingdom is run by witches. It’s right there in the book. > The book is host to an evil spirit. People who read it too much become cursed and the book will follow them around bringing bad luck. I am shocked to find out that I am not one of the celestial spheres! The UK being run by witches I knew. Any idea which room is the gate to hell? I don’t remember Darth Johanson and his train awesome! These tidbits are great! I have to vote for Anchorperson Smith as my favourite screen name — it is an anagram of Christopher Manson. Ooo! Ooo! Tell me where I am from! My GPS is broken. MIT10 – The celestial sphere person was using people’s names to make the connections. Apparently “MIT10″ does sound like a celestial spirit. Jordan – Actually I have no idea where you are from. For some reason the IP address thingy only works for some people. The only thing I think may be going on is that the people whose IP doesn’t register are from a country other than the US. A couple times people from Canada and the UK their IP addresses don’t appear but this has never happened with someone whose IP address registers as being from the US. Could be a coincidence though. Aria – I didn’t know (or forgot!) that “Anchorperson Smith” was an anagram for “Christopher Manson.” That’s fantastic, I think we have a winner! Missed it! I like the solution. It was IN SLY! WR You’ve made our lives a bit better by getting the Maze train rolling. Thank you. Good health and healing! It doesn’t count as engaging with the internet when nobody reads it. To those of you who will be checking in tomorrow. I’m sorry I could not wait till tomorrow to write this. This is the crappiest possible ending to the abyss phase in the saga of MAZE. I have a critical deadline approaching and in the midst of this I am off to the hospital. The solution to the hints would have been terribly anti-climatic anyway. You have all solved the riddle of the Guide already, just not the last tiny bit. Do you want all the hints now so it is finished pronto, or should I just tell you the answer, or should I just leave it alone? If I post hints I would post the solution at the very latest by 10 am tomorrow CST if no one gets the solution by then. I vote give us the hints. I can tell Janice. Why not just save it for later? I don’t think that is a good idea. I may not be able to get back to it anytime soon. Sure, give us the hints. Are you okay/in pain? Yes, I am in pain but I’m okay. Thank you. Usually I post the hints one at a time from most difficult to easiest. I don’t think a hint has gotten as far as the last one yet. At 8 pm I will be posting all the hints for the Riddle of the Guide all at once. Thank you for your understanding. Hints please! Also, hope all goes well for you at the hospital. Sending good thoughts. There’s a room in the Loop containing two objects that are related to each other in a way nobody’s mentioned on this site before. It leads to a room that has two completely different objects that nevertheless have the same sort of connection. Together, these four objects constitute a message not only suggesting that you should go from the first room to the second, but also where to go from there. Is this hint “fake” because it’s so obvious? MIT10 it’s tomorrow. Thirty days hath September…etc.